Last night after putting up these 12 pints of rhubarb-ginger-orange preserves (9 pounds rhubarb, 6 pounds sugar, zest and juice of 4 oranges, one thumb of ginger chopped very fine) I settled in on the couch and flipped open my laptop and found this slightly annoying article over on Salon: Can It. The tag line reads: “I leapt on the new pickling and preserving. Is it a money saver in a busted economy, or a luxury craft?” I was annoyed because the author makes the somewhat specious argument that because she made very expensive jam with fruit from the greenmarket, that canning doesn’t save money, and hence is a “luxury” hobby for hipsters, not a useful skill for thrifty householders. Clearly this is one of those pieces that claim to “debunk” the “myth” that growing your own or canning your own or making your own will “save you money.” Like anything else, it will only save you money if you’re paying attention, and if you’re trying to save some money. Part of the reason I found the Salon article so annoying was that I’d put up all that rhubarb because Chuck showed up at my house with a big box saying “this was growing at my house — can you do something with it?” (We won’t mention that I’d been ignoring my own rhubarb patch.) Rhubarb is not my favorite thing, but there it was, and I have my fabulous French Jam Pot that hadn’t been broken out yet, and the remains of a 25 pound bag of sugar I bought on sale last summer. I have canning jars by the dozen, and there were some oranges drying up in the fruit basket, as well as a big thumb of ginger in the fridge. I had everything I needed to “do something” with the rhubarb, and so I did. It wasn’t that big a deal — chop it up, put it in the huge pot, put the jars on to sterilize, cook until done then hot pack in the jars. In the meantime we looked at the chicken house problem, cooked some dinner, read the paper and ranted about what a terrible job our Senator Max Baucus is doing on health care reform, and then I put up preserves. Like any cooking that you do for thrift, it requires that you use what you have, not go out and buy a bunch of stuff. My dozen pints cost me a couple of hours work, but they’ll be good in my beloved French Yogurt Cake, or on ice cream, or as gifts in Christmas boxes. I guess that’s what I found so annoying about the Salon article — it seemed like a straw man argument. No, canning won’t save you money in and of itself if you’re not paying attention to your inputs. Yes, learning these old skills, gardening, canning, perhaps even raising chickens, can save one some money if you’re in it for the long haul, and if you pay attention. For me, the pleasure in learning these things also stems from my desire to know how to do things for myself. I’m no Peak Oiler, but I do think that we’d all do well to dial back the consumption a little bit, and to make sure we know how to feed and clothe ourselves, and who knows? 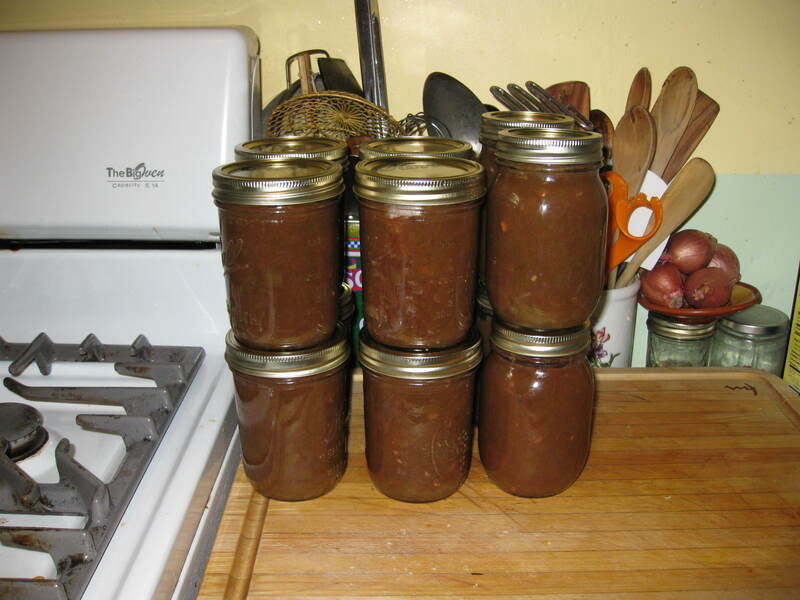 there might come a time when having some basic food preservation skills could come in handy. I also like knowing where my food comes from — in this case, the back yard. I know what went on it, or into it in the case of the chickens. I know who touched it. I know how it was processed. Is it a fad? Perhaps in some places, but the nice thing about living in a small town in a rural area, is that all this stuff is pretty normal. People never really stopped canning here, and while chickens in town haven’t been common in recent years, all it takes is a little dog walking up and down the alleys to notice how many chicken coops there are around here. It’s not the skills themselves that will save you money, it’s what you do with them — I guess that was the gap in logic that bugged me as I sat on my couch last night after putting up rhubarb preserves. If you can expensive stuff, you won’t save money. If you can what you have, you might. Common sense, really. And good jam is worth it, too. We got laying hens a year ago, and there was a significant upfront investment involved. We started with one rooster and 12 pullets. Since then we’ve bought new chicks, hatched babies and had a number of losses. The losses WILL continue. You may go long periods without any, but you will always lose a bird here and there. I’ve never done the math to determine whether we’ve made our money back, but I can say this: with my current arrangement, it costs me about $2.50 per dozen to produce my own eggs. I was paying $5 before. I sell the excess to friends and coworkers for $3 a dozen, and that makes me enough cash to pay for feed. So the chickens more or less pay for their own maintenance. What comes out of my pocket is startup costs, maintenance, and buying new stock as needed. And I know that if things go to hell, I have a protein source in my yard. 🙂 That’s better than money in the bank. *The more scraps and forage you can give them access to, the less bagged feed they’ll require, and the eggs will actually be better. Also, less cash out of pocket for you. They’ll eat virtually ANYTHING. I read a book once — I can’t remember now what it was; the author was Western (I mean Western US) — in which the main character’s mother makes jam from apple peels. It’s just a tiny anecdote in the larger story, but I loved it, I loved that image of a woman making jam from scraps. Now THAT saves money. I didn’t read the Salon article, but it strikes me as comparable to buying a $6 loaf of handmade bread and then drying it out in the oven and making bread pudding from it. My sister-in-law did that once. For goodness sake! Bread pudding is what you make when your lovely $6 loaf dries out after a party, because you left it out overnight because you were hammered, and now you’re so sorry for that… Just so, jam is what you make when you have too many berries to eat fresh. You don’t buy fresh, expensive berries and then make jam from them. Sheesh. I think the greatest appeal to these “homesteading” skills is that they teach you to be resourceful and to problem solve if you’re trying to do it the thrifty way. Craigslist for $15. This was after I thought I couldn’t possible afford backyard chickens because I was looking into housing them in a $300 Eggloo Tractor. You just have to have a little imagination…like to use shipping crates. (Great idea, BTW). So, where there’s a will there’s a way, I guess as the saying goes. And overall what I’ve found with my food, is that if I can do it myself as much as possible (grow my own, raise my own, can and freeze ect.) I’m eating higher quality SOLE food than I could afford if I was just buying it from someone else. I also found that Salon piece infuriating. I live in the middle of Center City Philadelphia, and still manage to can lots of good stuff for cheap (it does help that I’ve got a number of wonderful u-pick places within a half hours drive right over the bridge in New Jersey). Tara– thanks as always for the chicken advice. Like I said, I was prepared for chicken failure, but it still bums me out. The dog can’t really help it — he is a bird dog after all, was bred for this (and thanks to the dear departed brother, was never properly trained). And I love hearing the creative approaches everyone has to householding skills — I do believe it’s useful to know how to do things for ourselves, even if magazine writers might try to gin up lots of comments by taking a deliberately ridiculous line in an article. The two that our dogs didn’t kill we lost to coyote. I’m so glad you posted on this. I too found it silly. But then I thought: You know, it’s a lot like those ’80s cookbooks on French food that stressed the authenticity of doing everything from scratch, and sent you off to the market for vegetables and herbs and chicken parts which you roasted to make stock to give you a foundation for all the other dishes the book was going to teach you. You ended up with a $50 stock, which was absurd (and, culturally speaking, about as un-French as could be).